Your book is collected with a completed binding slip; filled in with information on the selected colour, collating instructions, lettering instructions etc. The spine of the periodical is then ground to a depth of 2-3 mm; this removes any old glue and seperates the paper into single, sewable sheets. The periodicals are then collated into volumes according to collating instructions. Periodicals collated in single sheet form are then sewn using a Smythe Cleat Sewer along with its inner end paper. The combination of thread wrapped sections and dovetail cuts into the spine, which allows a maximum gluing area, creates a strong flexible binding which allows the book to open flat for photocopying. 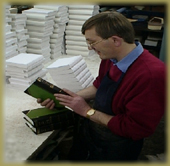 Suitable periodicals can also be sewn using our more traditional Smythe Saddle Sewer, while more specialised books or outsizes can be handsewn. The periodical then receives its first glue application and it's outer Endpapers. 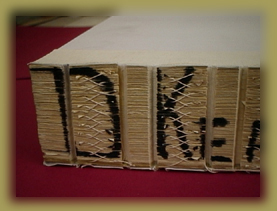 When the first glue application is dry the head, tail and fore edge of the periodical are shaved to a depth of 1-2 mm. This gives the volume a more presentable appearance and also helps to protect from the effects of dust and wear. Rounding gives the spine a concex shape, giving the book it's traditional look, while backing creates a shoulder along the spine which along with the cover boards, creates a "hinge" helping the book to open flat. 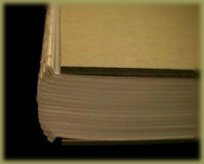 This process noticeably strengthens the binding of the volume as compared to a book whose spine is left "flat". Next the book lined with mull and craft paper which serves to reinforce the spine as well as attaching the cover to the Endpapers. 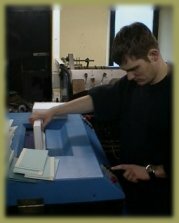 We firmly believe that this process creates a stronger binding then the use of crêpe paper alone. The book cover is made with arbelave library buckram. The spine is reinforced with cord at the head and tail to protect against rough handling and to prevent ingress of dust down the spine. A record of any previously bound periodicals exists in our custom designed computer program containing your book colour as well as the type size and positioning. 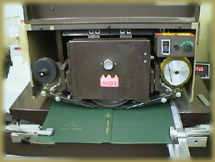 To attach the cover to your book, the bookbinder applies glue to the end papers and attaches the cover, is then placed in a book press to ensure that the cover is firmly attached to the book. 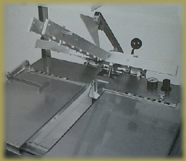 At the same time French joints are sunk into the spine to finish the book's "hinge". Finally the book is inspected before it is considered "Finished".